Tales of the Shadowmen 9 TOC Announced! Matthew Baugh: Tournament of the Treasure starring Steve Costigan, Townsend Harper, The Black Coats. Nicholas Boving: Wings of Fear starring Harry Dickson, Bulldog Drummond. Robert Darvel: The Man With the Double Heart starring The Nyctalope. Matthew Dennion: The Treasure of Everlasting Life starring Allan Quatermain, Dr. Miguelito Loveless, The Black Coats. Win Scott Eckert: Violet’s Lament starring Sir Percy Blakeney’s daughter, Countess Nadine Carody, The Black Coats. Martin Gately: Wolf at the Door of Time starring Doctor Omega, Moses Nebogipfel, The Nyctalope. Travis Hiltz: What Lurks in Romney Marsh? starring Doctor Omega, Doctor Syn. Paul Hugli: As Time Goes By… starring Doctor Omega, Rick Blaine. Rick Lai: Gods of the Underworld starring The Black Coats, Vautrin, Doctor Lerne. Jean-Marc Lofficier: Dad starring Glinda. Nigel Malcolm: To Dust and Ashes, in its Heat Consuming starring Harry Dickson, Professor Quatermass. David McDonald: Diplomatic Freeze starring Flashman’s son, The Nyctalope’s father, The People of the Pole. Christofer Nigro: Death of a Dream starring The Phantom of the Opera, The Black Coats, The Domino Lady. John Peel: The Benevolent Burglar starring Maigret, J.G. Reeder, The Saint. Neil Penswick: The Conspiracy of Silence starring Fantômas. Pete Rawlik: Professor Peaslee Plays Paris starring Pr. Nathaniel Wingate Peaslee, Hercule Flambeau, The Black Coats. Joshua Reynolds: Nestor Burma Goes West starring Nestor Burma, Jim Anthony, Irma Vep. Frank Schildiner: The True Cost of Doing Business starring Mr. Big, The Black Coats. Bradley H. Sinor: The Silence starring Michel Ardan, Colonel Moran, John Carter. Michel Stéphan: Vampire in the Fist starring Irma Vep. 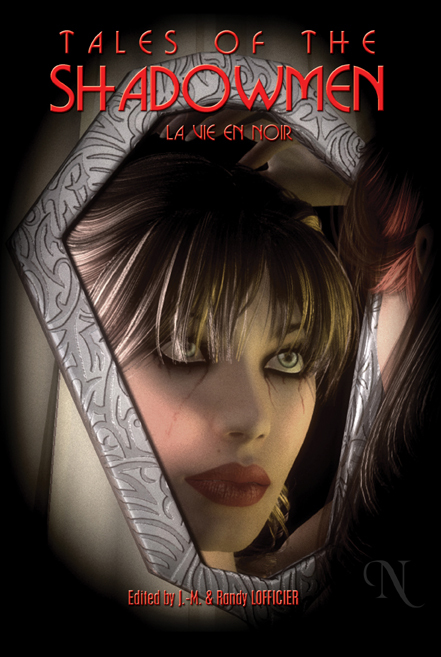 If Edith Piaf liked to sing about la vie en rose, this volume of Tales of the Shadowmen, the first and only international anthology devoted to paying homage to the world’s most fantastic heroes and villains, is dedicated to la vie en noir, the darker side of life. And what could be darker than the sinister brotherhood of criminals known as the Black Coats and their legendary treasure, a malignant self-aware entity that is the embodiment of greed and avarice? This entry was posted in Writing and tagged anthology, short story, tales of the shadowmen, TOC on October 2, 2012 by David.